(left) Fabio Viviani enthusiastically describes his special ingredients to Linda, Bonnie and Joe. 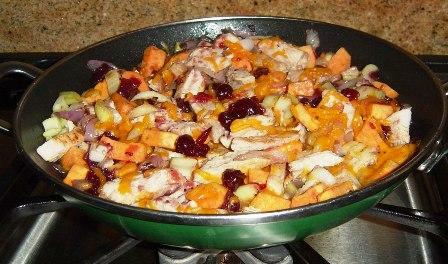 Roasted turkey, cranberry sauce, vegetables and sweet potatoes combine to make this tasty, quick meal for this busy time of year. You don’t need to wait for turkey leftovers. You can buy roasted turkey pieces in the meat department or roasted turkey in the deli. If you buy deli meat, ask them to slice it thick so you can cut it into cubes. If you have leftover vegetables, potatoes, gravy or stuffing, use them and create your own turkey hash. This is a one-pot meal that tastes great the second day. Double the recipe if you have time and save the rest for another day. It also freezes well. If using fresh potatoes, place in a bowl and microwave on high 2 minutes. Heat the oil in a large nonstick skillet over medium-high heat. Add the potatoes, onion, celery and garlic. Saute 5 minutes. Add the turkey and sauté 2 minutes. Add the cranberry sauce and water. Sauté another minute. Add salt and pepper to taste. Sprinkle the cheese on top and cover with a lid. Cook 1 minute or until cheese melts. Makes 2 servings. To buy: 1/2 pound sweet potatoes, 1 bunch celery, 3/4 pound roast turkey, 1 can whole berry cranberry sauce and 1 small package shredded, reduced-fat Monterey Jack cheese. Staples: Canola oil, onion, garlic, salt and black peppercorns. Any type of vegetables and potato can be used. Follow the guideline of the recipes for the amounts needed. If you have chicken or other soup on hand, use that instead of water in the recipe. Any type of shredded cheese can be used.